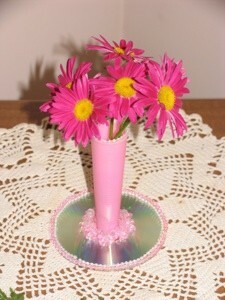 Make a vase for artificial flowers by recycling an empty thread cone and a used CD. Begin by running a line of glue around the narrow end of the thread cone and glue it to the center of the CD. Let dry a few minutes to firm up. When secure, glue loose beads to the CD around the bottom of the cone. On the very outside edge of the CD, glue a line of string beads, working just a few inches at a time. Glue a second string just inside the first. Trim the top edge of the cone with another string of beads. How cute. I have lots of those thread cones too. I wondered what they's be good for. That's really cute! perfect for a preteen girl! You should sell them at craft shows-or at least several and give to nieces, goddaughters, etc. as a party favor for a girls birthday party. The flowers could also be replace with a matching brush, comb, makeup brushes etc. Good luck to you! Clever! We used to use those cones in VBS way back when but nothing as cute. Where do you buy these cones at?